IBM TS4300 Tape Library for Lenovo (Machine Type 6741) combines IBM enterprise tape automation and reliability with open system affordability. It is a high-density, highly scalable, easy-to-manage solution designed to keep data securely stored long-term, while helping reduce the costs associated with data center space and utilities. This product guide describes the TS4300 Tape Library that is available from Lenovo. It provides essential technical and pre-sales information on the TS4300, its key features and specifications, components and options, and configuration guidelines. This guide is intended for technical specialists, sales specialists, sales engineers, and IT architects who want to learn more about the TS4300 Tape Library and consider its use in IT solutions. The TS4300 utilizes modular design to meet growing long-term storage requirements. Starting with a single 3U base module, customers can scale the tape library by adding up to six 3U expansion modules for the overall capacity of up to 272 LTO cartridges. Each 3U base or expansion module can house up to 40 cartridges in two removable magazines (the lowest module in the TS4300 configuration or single-module configurations can hold up to 32 cartridges). Each 3U module can accommodate up to three half-high tape drives or a combination of one half-high tape drive and one full-high tape drive. The choice of the tape drives includes IBM LTO Ultrium 8, Ultrium 7, and Ultrium 6 tape drives with SAS or Fibre Channel host connectivity interfaces. The TS4300 is an ideal solution if you need a larger capacity or higher performance tape backup. This library is an excellent choice for tape automation for Lenovo servers running Windows and Linux operating systems. Featuring the latest LTO Ultrium 8 technology, the TS4300 Tape Library provides up to 3.264 PB of native backup storage. With IBM LTO Tape offerings that are available from Lenovo, Lenovo can be your trusted partner that offers "one stop shop" and single point of contact for delivery of leading edge technologies and innovations from Lenovo and other leading IT vendors. These offerings can satisfy the wide range of your end-to-end IT infrastructure needs, including end-user devices, servers, storage, networking, services, management software, and financing. Scalable tape library that is designed for high capacity, high performance, and high reliability. Support for half-high (HH) or full-high (FH) LTO Ultrium 8, Ultrium 7, or Ultrium 6 tape drives with 6 Gb SAS or 8 Gb Fibre Channel interfaces. Support for up to three half-high tape drives or a combination of one full-high tape drive and one half-high tape drive in each 3U module. The maximum number of drives in the tape library ranges from up to 7 full-high and up to 7 half-high to up to 21 half-high tape drives. Native data transfer rate of up to 360 MB/s (Ultrium 8 FH), 300 MB/s (Ultrium 8 HH or Ultrium 7), or up to 160 MB/s (Ultrium 6) per tape drive. Native cartridge capacity of up to 12 TB (Ultrium 8), 9 TB (Ultrium 7 initialized LTO 8 Type M), 6 TB (Ultrium 7), or 2.5 TB (Ultrium 6). 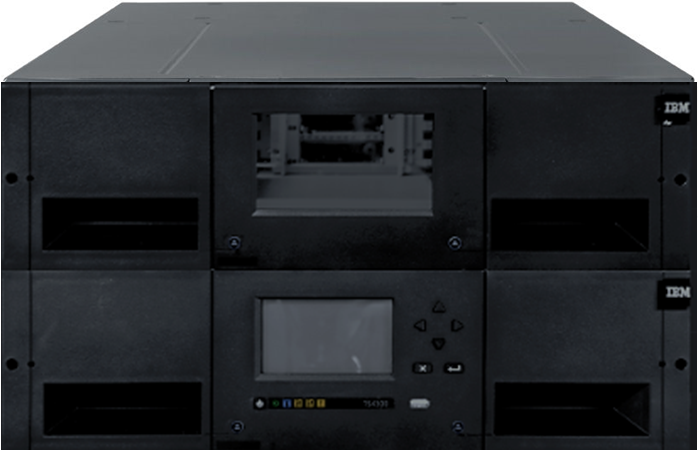 Two removable magazines in each 3U module that can house up to 20 data cartridges each for a total of up to 272 cartridges in the tape library to enable quick population of the tape library and ease the storage needs for media. Flexibility in configuring a 5-slot I/O Station for each module (4-slot I/O Station in the lowest module or single-module configurations), or one I/O Station can be accessed by several modules to help support continuous library operations, while importing and exporting media with little or no disruption to library operation. A standard high-speed bar code reader with which you can operate the TS4300 in random access mode. Sequential mode is not currently supported. Mixed media support, including IBM LTO Ultrium 8, 7, and 6 WORM (Write Once Read Many) media (not available from Lenovo). Remote management capabilities to allow for remote administration of the TS4300 through a web interface. Multi-path feature to allow sharing of the library robotics across heterogeneous applications independently of each other. The library can be partitioned into up to 21 logical libraries (each partition must have at least one drive). It also can provide each logical library its own separate and distinct drives, storage slots, and control paths. Optional Library Managed Encryption on LTO Ultrium 8, Ultrium 7, and Ultrium 6 tape drives by using the IBM Security Key Lifecycle Manager software (not available from Lenovo). Optional Path Failover that enables the host device driver to transparently switch to an alternative path if there is a communication path failure to the application. Extra power supplies for redundant operations. 6 Gb SAS or 8 Gb Fibre Channel attachments for connection to Lenovo servers that run Microsoft Windows or Linux server operating systems. The 16-channel actuator (LTO Ultrium 6) or 32-channel actuator (LTO Ultrium 7 and Ultrium 8) provides precision head alignment to help support higher track density and improved data integrity. These technologies help improve the reliability of loading and unloading a cartridge, and to retain the pin even if tension is dropped. An independent loader motor, coupled with the positive pin retention, causes the tape to thread with a higher level of reliability. There are 6656 data tracks in Ultrium 8, 3584 data tracks in Ultrium 7, and 2176 data tracks in Ultrium 6. The high-bandwidth servo system features a low mass servo to help more effectively track servo bands and improve data throughput with damaged media in less-than-optimal shock and vibration environments. The IBM patented Surface Control Guiding Mechanism guides the tape along the tape path in the Ultrium 8, 7, and 6 Tape Drives. This method uses the surface of the tape (rather than the edges) to control tape motion. This configuration helps reduce tape damage (especially to the edges of the tape) and tape debris, which comes from the damaged edges and can accumulate in the head area. IBM LTO Ultrium 7 and 6 Tape Drives use GMR head technology with beveled contouring for reducing striction and friction. This head design was demonstrated in enterprise tape products to help minimize contact, edge damage, debris accumulation, and wear on the tape as it moves over the read/write heads. To help enhance reliability and prolong the life of the drives, some of the most robust components available are used such as an all metal clutch, steel ball bearings in loader, robust leader block design, and a single circuit card. Separate writing of multiple filemarks evokes any write command of two or more filemarks to cause a separate data set to be written that contains all filemarks after the first. It helps improve performance if a subsequent append overwrites somewhere after the first filemark. This change helps prevent having to rewrite data sets that contain customer data and the first filemark, if such an append occurs. The Ultrium LTO uses LTO-DC, which is an implementation of a Lempel-Ziv class 1 (LZ-1) data compression algorithm. LTO-DC is an extension of Adaptive Lossless Data Compression (ALDC) and an improvement over previous IBM lossless compression algorithms. IBM patented "Scheme-Swapping" compression looks ahead at incoming data and determines the most efficient storage method (ALDC or pass-through mode) to help optimize data compression and increase data throughput. The compression ratio is up to 2.5 to 1 for LTO Ultrium 8, 7, and 6. Contained within the LTO Ultrium data cartridge is the LTO-CM, which is a passive, contactless silicon storage device that is physically a part of the cartridge. The LTO-CM holds information about that specific cartridge, the media in the cartridge, and the data on the media. The storage capacity of the Generation 8, 7, and 6 LTO-CM is 16320 bytes. Communication between the drive and the LTO-CM is via a low-level RF field transmitted by the drive to the cartridge. The Ultrium Tape Drive uses SARS to help isolate failures between media and hardware. SARS uses the cartridge performance history that is saved in the CM module and the drive performance history that is kept in the drive flash EEPROM to help determine the likely cause of failure. SARS causes the drive to request a cleaner tape, mark the media as degraded, and indicate that the hardware degraded. This technology reduces the total number of components in the drive, helps lower chip temperatures, and reduces power requirements to deliver a more reliable drive. The sixth-generation drive electronics provide error correction of soft errors in the memory arrays in data and control paths. The following figure shows the front of the TS4300 Tape Library base module. The following figure shows the front of the TS4300 Tape Library expansion module. 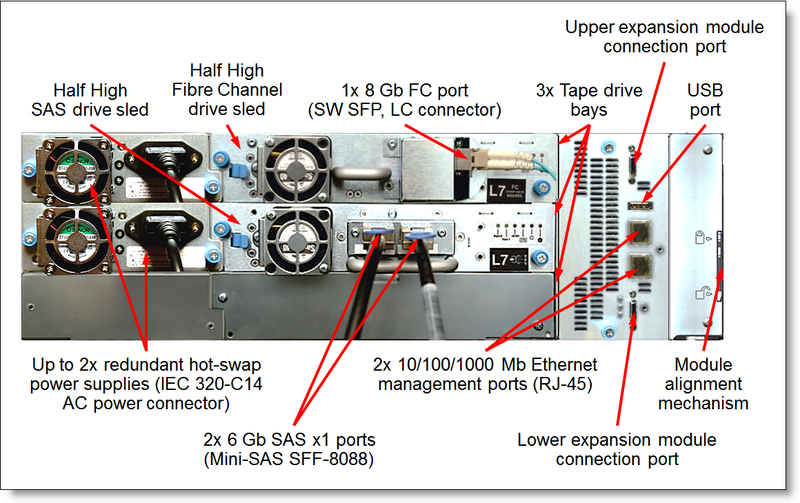 The following figure shows the rear of the TS4300 Tape Library base module with the half-high Fibre Channel drive sled and half-high SAS drive sled. 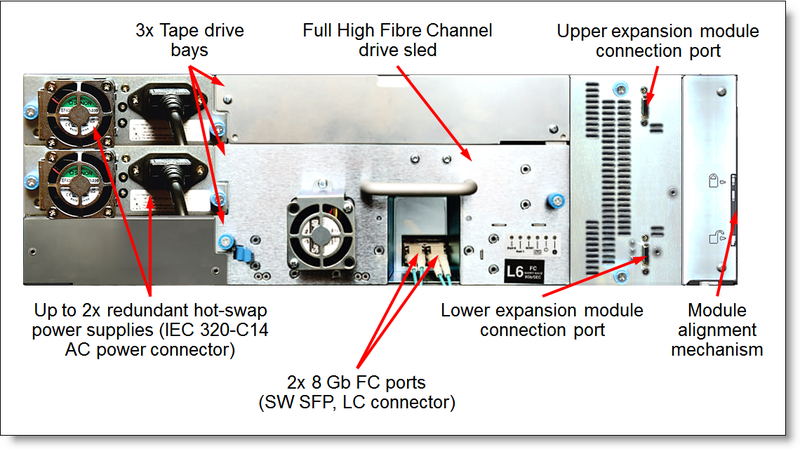 The following figure shows the rear of the TS4300 Tape Library expansion module with the full-high Fibre Channel drive sled. The following table lists the TS4300 Tape Library system specifications. Base module: 3U rack-mount or stand-alone. 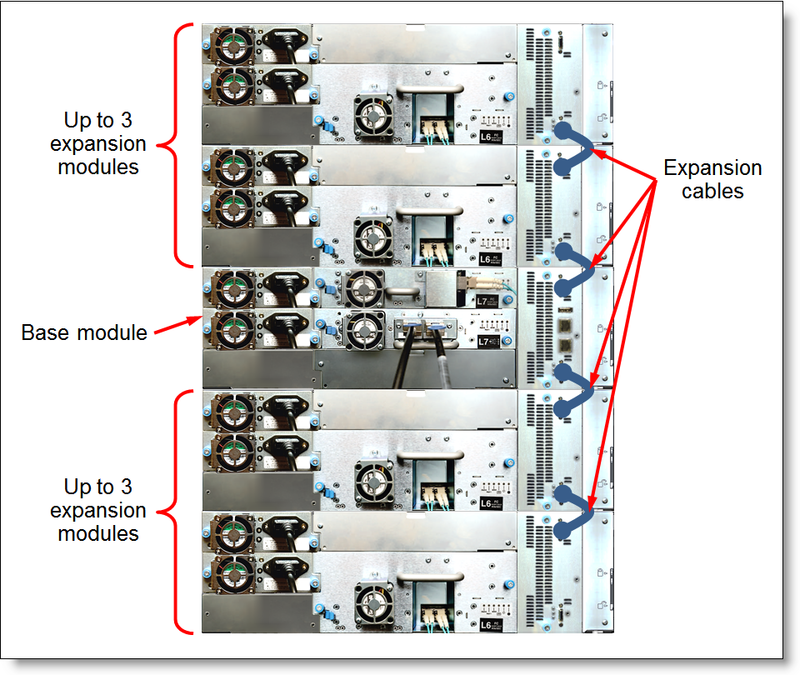 Expansion module: 3U rack-mount; up to 6 expansion modules. Drive technology LTO Ultrium 8, LTO Ultrium 7, and LTO Ultrium 6 Full-High (FH) and Half-High (HH) tape drives. Half-High SAS tape drive: 2x 6 Gb SAS x1 ports (Mini-SAS SFF-8088). Half-High FC tape drive: 1x 8 Gb FC port (short-wave [SW], LC connector). Full-High FC tape drive: 2x 8 Gb FC ports (short-wave, LC connector). Per module: Up to 1x full-high and 1x half-high tape drives, or up to 3x half-high tape drives. Per 7-module library: From up to 7x full-high and 7x half-high tape drives to up to 21x half-high tape drives. Per module: 40 (the lowest module or single-module configurations: 32). Per module: 5 (the lowest module or single-module configurations: 4). LTO 8 (L8): 12 TB. LTO 7 initialized LTO 8 Type M (M8): 9 TB. LTO 7 (L7): 6 TB. LTO 6 (L6): 2.5 TB. LTO 8 (L8): Up to 480 TB (the lowest module or single-module configurations: 384 TB). LTO 7 (M8): Up to 360 TB (the lowest module or single-module configurations: 288 TB). LTO 7 (L7): Up to 240 TB (the lowest module or single-module configurations: 192 TB). LTO 6 (L6): Up to 100 TB (the lowest module or single-module configurations: 80 TB). LTO 8 (L8): Up to 3.264 PB. LTO 7 (M8): Up to 2.448 PB. LTO 7 (L7): Up to 1.632 PB. LTO 6 (L6): Up to 680 TB. LTO 8 FH: Up to 360 MB/s. LTO 8 HH, LTO7: Up to 300 MB/s. LTO 6: Up to 160 MB/s. Software features Library partitioning, Path Failover (optional), Library Managed Encryption (optional). Security features Secure Socket Layer (SSL), user level security, LDAP, LTO encryption (optional). 2x 10/100/1000 Mb Ethernet ports (UTP, RJ-45) for remote management: Web-based GUI; SNMP and email notifications. 2x USB ports (service technician use only). Cooling Fixed fans on the tape drives and power supplies. Base module: The first power supply is included; the second power supply is optional. Expansion module: The first power supply is optional; the second power supply is optional. The first power supply is required if the expansion module contains a tape drive. Hot-swap parts SAS and Fibre Channel drive sleds, power supplies. Width: 446 mm (17.6 in.). Depth: 873 mm (34.4 in.). Height: 133 mm (5.2 in.). Base module: 21 kg (46.3 lb). Expansion module: 13 kg (28.7 lb). Warranty Three-year customer-replaceable unit (CRU) limited warranty with 9x5 next business day parts delivered. Service and support Optional warranty service upgrades are available through Lenovo Services: onsite coverage, 24x7 coverage, 2-hour or 4-hour response time, 6-hour or 24-hour committed service repair (select countries), 1-year or 2-year warranty extensions. Host operating systems* Microsoft Windows Server 2012, 2012 R2, and 2016; Red Hat Enterprise Linux (RHEL) 6 and 7; SUSE Linux Enterprise Server (SLES) 12. * The operating systems shown are for Lenovo servers. The TS4300 might support other operating systems. For a full list of supported operating systems, refer to the System Storage Interoperation Center: http://ibm.com/systems/support/storage/ssic. The following table lists the ordering information for the TS4300 Tape Library models. Tape drives are not included; at least one tape drive must be ordered with the TS4300 unit (See Tape drives for details). A power cable is not included. A rack power cable or a country-specific line cord must be ordered with the TS4300 unit (See Power supplies and cables for details). Rack mount kit is not included; it should be ordered with the TS4300 unit, if required (see the following table for details). Rack mount kit is required for each module if the configuration contains more than one module. The following table lists the rack mount kit for the TS4300 units. The following figure shows connectivity topology for the TS4300 tape library. Each TS4300 module (base or expansion) can accommodate up to three LTO Ultrium half-high tape drives or a combination of one LTO Ultrium half-high tape drive and one LTO Ultrium full-high tape drive. The following table lists the supported tape drives for the TS4300. Configuration note: Tape drive support options provide wrap tools (loopback connectors) to isolate drive sled issues. The Fibre Tape Drive Support is required when at least one Fibre Channel tape drive is installed in the tape library, and the SAS Tape Drive Support is required when at least one SAS tape drive is installed in the tape library. A SAS cable or Fibre Channel cable is required to attach a tape drive in the TS4300 Tape Library to a host. The following table lists supported cable options. * The interposer is used on the host side to connect up to four SAS tape drives to a single Mini-SAS x4 port on a SAS HBA with up to four 2 m Mini-SAS to Mini-SAS cables (part number 00NA009). ** The Y SAS HD cable is used to connect up to two SAS tape drives to a single Mini-SAS HD x4 port on a SAS HBA. The TS4300 3U module supports up to 40 data cartridges and comes standard with two removable tape magazines with 20 cartridge slots each. More removable tape magazines can be ordered for the TS4300, if needed. Configuration note: Single-module configurations and the lowest module in the multi-module configurations support up to 32 data cartridges. The following table lists tape media options and extra magazines that can be ordered for the TS4300. LTO Ultrium 8 availability: The LTO Ultrium 8 Data Cartridges (01KP955) are planned to be available for ordering in the future. LTO Ultrium 8 tape drives can read and write LTO Ultrium 8, LTO Ultrium 7, and LTO 7 initialized LTO 8 Type M data cartridges. A 5-Pack of the Ultrium 6, 7, or 8 Data Cartridges includes five unattached barcode labels. An LTO 7 initialized LTO 8 Type M data cartridge is a new (unused) LTO 7 data cartridge labelled and initialized to support 9 TB native storage capacity in the LTO 8 tape drive. Once initialized, an LTO 8 Type M cartridge cannot be used in the LTO 7 tape drives, and it cannot be changed back to a 6 TB LTO 7 cartridge. LTO M8 Uninitialized Data Cartridges 5-Pack (02JH005) includes five uninitialized LTO 7 data cartridges and five M8 barcode labels. These cartridges will be automatically initialized by the tape library firmware while under the control of ISV applications that recognize the M8 barcode label. The TS4300 offers an optional path failover feature that enables the host device driver to resend the command to an alternative control path for the same logical library to ensure smooth library operations if there is a communication error. With control path failover, the alternative control path can include another HBA, SAN, or library control path drive. The device driver starts error recovery and continues the operation on the alternative control path without interrupting the application. Library Managed: Available for Linux and Windows; requires the IBM Security Key Lifecycle Manager (SKLM). Application Managed: Available with third-party software such as IBM Spectrum Protect. Library Managed Encryption requires an optional encryption license. Application Managed Encryption does not require a license. The following table lists ordering information for optional software features for the TS4300. The TS4300 modules support up to two redundant hot-swap 230 W AC power supplies. The base module comes with one power supply, and the second power supply can be ordered for redundancy. The expansion module comes without power supplies, and the first power supply is required when at least one tape drive is installed in the expansion module. The following table lists the power supply options for the TS4300. The TS4300 modules and the power supply options ship without power cables. The power cables for the TS4300 are listed in the following table. The TS4300 Tape Library has a three-year Customer Replaceable Unit (CRU) warranty with 9x5/next business day (NBD) parts delivered. Lenovo provides end-to-end storage compatibility testing to deliver interoperability throughout the network. The TS4300 Tape Library supports attachment to Lenovo servers by using SAS or Fibre Channel connectivity. The following table lists currently available Lenovo SAS adapters that are compatible with the TS4300 SAS tape drives (direct attach). Other SAS HBAs also might be supported (for more information, see the System Storage Interoperation Center). The TS4300 supports FC switch-based attachments. Brocade and Cisco SAN switches can be used to provide FC connectivity for the TS4300. The Lenovo FC SAN adapters that are listed in the following table are compatible with the TS4300. Other HBAs also might be supported (for more information, see the System Storage Interoperation Center). The following tables list currently available Fibre Channel rack-mount switches and embedded switches for Flex System that are currently offered by Lenovo that can be used with the TS4300 in IT solutions. The following table lists the rack cabinets that are offered by Lenovo that can be used with the TS4300 tape library in IT solutions. The following table lists the power distribution units (PDUs) that are offered by Lenovo that can be used with the TS4300 tape library in IT solutions. The following table lists the uninterruptible power supply (UPS) units that are currently offered by Lenovo that can be used with the TS4300 Tape Library in IT solutions.